"Some strange signals have been found, but it's hard to confirm their origins, because these signals do not repeat," says says Li Di, chief scientist with the radio astronomy department of China's National Astronomical Observatories (NAOC).. "We look for not only television signals, but also atomic bomb signals. We shall give full play to our imaginations when processing the signals. It's a complete exploration, as we don't know what an alien is like." "We are lucky to be in a special era, with the next generation of giant telescopes on the way. 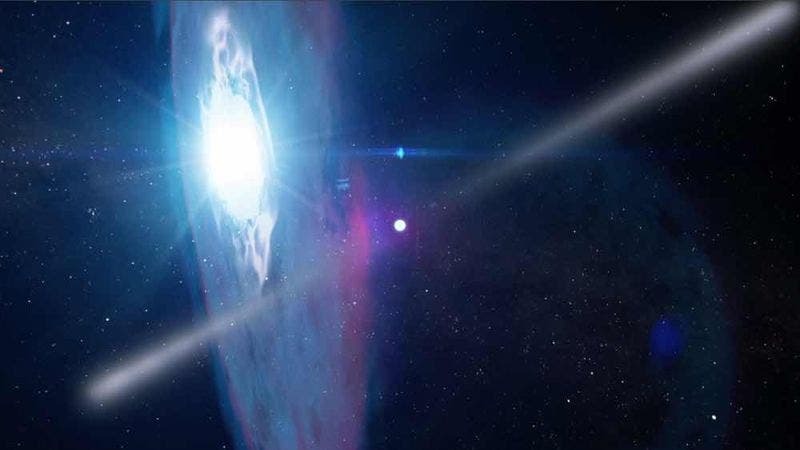 There may be some exciting discoveries in the following 10 to 20 years," says Mao Shude, director of the Center for Astrophysics of the Beijing-based Tsinghua University. 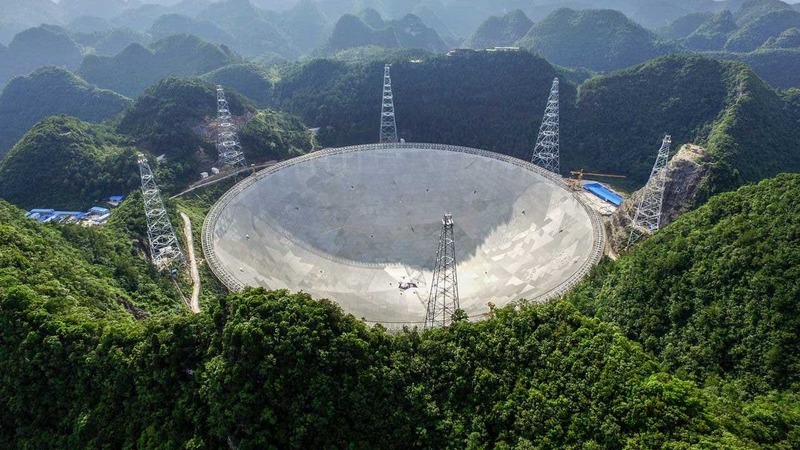 FAST, shown below, deep in the mountains of southwest China's Guizhou Province, is the world's largest radio telescope completed in September of this year, which has spurred several of China's leading astronomers to comment publicly about the potential as well as the unknown dangers to humanity of the search for advanced extraterrestrial civilizations. According to mainstream scientific opinion, it is possible that extraterrestrial life exists, as the Earth is not unique in the universe. Our galaxy has hundreds of billions of stars, many with solar-like planetary systems, and there are hundreds of billions of galaxies in the universe. So it' s reasonable to infer that Earth-like planets might be common, and the universe could teem with life. "I think primitive life is likely to be abundant, but intelligent life might be rarer," says Mao, also director of the Galaxy and Cosmology Division of the National Astronomical Observatories of China (NAOC), Chinese Academy of Sciences. The next generation of giant telescopes might help astronomers resolve some long-standing issues, such as analyzing the spectrum of distant planets, making it possible to detect biomarkers of life. Biomarkers are certain elements that might indicate the existence of life. An important biomarker, oxygen molecules, without supporting life, can only last for a short time compared with the 13.7 billion-year history of the universe. Oxygen easily reacts with other elements, and Mars appears red as a result of oxidation. "If we find a lot of oxygen molecules in the atmosphere of an extraterrestrial planet, they are probably produced by life activities," Mao explains. The most common method of searching for extraterrestrial life is to search first for planets similar to Earth, with plenty of sunshine, liquid water and a protective atmosphere. However, that method is constantly questioned as some speculate that life elsewhere in the universe might be quite different from that on Earth. "We don't know how to start if we don' t know what kind of life we are looking for. At least, we know what conditions are needed for life on Earth," Mao says. "So scientists tend to search for planets around Sun-like stars and put forward the concept of the 'habitable zone' ." "Nature, however, has a much more wild imagination than we do. For example, whether life can exist in ice at extremely low temperatures is unknown to us," Mao says. "It' s easy for scientists to start with familiar conditions and then gradually expand the search to an unknown territory." Over the past decade, astronomers around the world have identified more than 3,000 extra-solar planets. However, most are giant planets, probably composed of gas, because they are more easily detectable. A few dozen are Earth-like planets, which are likely composed of silicate rocks or metals and may have water on them. "Astronomers first pick sample planets suitable for life, and then think about further study and analysis, or even communication with them," Mao says. To further analyze the atmospheric composition of a planet, the telescope must be very sensitive to the sharp contrast of the light intensity between the star and the planet. The Earth is about one billionth of the Sun in brightness in the optical, a contrast still far beyond the range of current telescopes. For more effective observation, astronomers are also striving for breakthroughs in another critical technology – adaptive optics. When light from a star or any other astronomical object enters the Earth's atmosphere, it can be distorted by atmospheric turbulence, which can blur images produced by any telescope larger than tens of centimeters. This annoyed Isaac Newton more than 300 years ago when he discovered that larger telescopes could not form clearer images due to atmospheric distortions. But today, after years of development, many observatories around the world, including those with telescopes of 8 to 10 meters in diameter, are equipped with adaptive optics systems. Adaptive optics is a technology that aims to correct the distortions induced by atmospheric turbulence. The system is mainly composed by three parts: a wavefront sensor, a deformable mirror and a real time controller. The wavefront sensor is like the eye of the system, and it measures the light distortions a few hundred or even thousand times in one second, so that the turbulence distortion almost looks like a cartoon played frame by frame to the system; the real time controller acts like a super fast brain, and it calculates how correction should be applied and sends commands to the deformable mirror; and finally, like the hand of the system, the deformable mirror actually carries out those commands, and changes its surface shape accordingly to correct the distortions before the arrival of the next command. 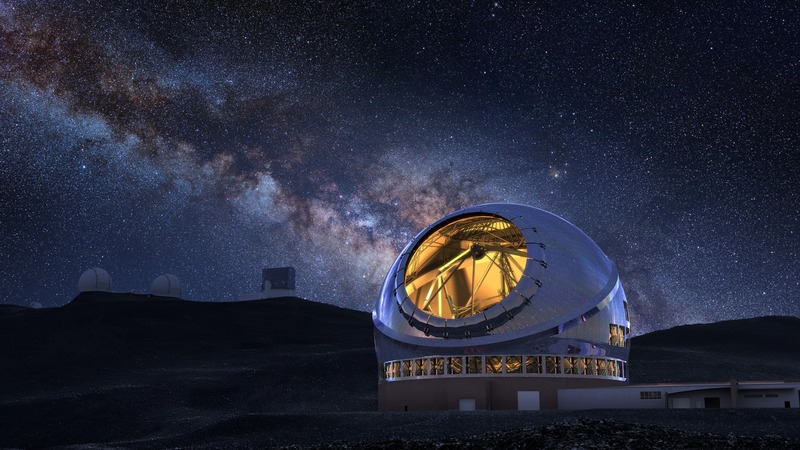 The next generation of ground-based telescopes, including the Thirty Meter Telescope (TMT shown below), the Giant Magellan Telescope (GMT) and the European Extremely Large Telescope (E-ELT), will have better adaptive optics systems, so they will be central to future observations, says Feng Lu, an associate researcher with the NAOC. Compared with space telescopes, ground-based telescopes can be larger and connected to more instruments, and can work longer and look deeper into space. The adaptive optics technology will improve their resolution close to or even above space telescopes, making them capable of observation tasks previously impossible on the ground, such as tracking extra-solar planet candidates, Feng says. For example, with the assistance of adaptive optics, TMT will have a resolving power and sensitivity much greater than the Hubble Space Telescope when it goes into use around mid-2020s. One of its major tasks will be to analyze the spectrum of extra-solar planets. But the next generation of space telescopes will also revolutionize astronomy. The Transiting Exoplanet Survey Satellite (TESS), to be launched by the U.S. National Aeronautics and Space Administration (NASA) in 2017, is one of them. Kepler, TESS' predecessor launched by NASA in 2009, is the world's first space observatory dedicated to the search for planets outside our solar system. So far, Kepler has confirmed 2,325 extra-solar planets, more than 70 percent of the total. Twenty-one of them are Earth-like, staying in habitable zone and within twice the size of Earth. While both can monitor planetary transits, TESS is capable of carrying out all-sky surveys, while Kepler can only observe a small part of our region of the Milky Way. "More importantly, TESS will look for extra-solar planets in orbit around the brightest stars, which will help analyze the physical nature of these planets. Kepler's planets are often around dim stars, which makes it difficult to carry out follow-up studies," Mao says. "The number of planets that TESS will detect is not necessarily much more (than Kepler), but the quality will be more advanced." As well as searching for Earth-like planets, scientists also scan the skies for extraterrestrial signals via radio telescopes, as some believe other civilizations will inevitably produce and release radio waves, as we do, during their evolution. Frank Drake, a U.S. astronomer and astrophysicist, was the first to test the method. In 1960, he started Project Ozma, a pioneering SETI (search for extraterrestrial intelligence) experiment, at the U.S. National Radio Astronomy Observatory at Green Bank, West Virginia. The objective was to examine nearby Sun-like stars for signs of life through interstellar radio waves. Although the project ended in vain, it triggered dozens of later SETI programs. However, the work of selecting possible meaningful signals from massive background noise consumes time and resources. The Space Sciences Laboratory, at the University of California, Berkeley, launched the SETI@home ("SETI at home") project in 1999, to search for possible radio transmissions from extraterrestrial intelligence via public volunteer computing. Part of the worldwide SETI effort, the project uses observational data from Puerto Rico's Arecibo Observatory, the world's current largest telescope, and the Green Bank observatory. The data, taken "piggyback" or "passively" while the telescopes are used for other scientific projects, are divided into small chunks and sent to millions of home computers for analysis. The software searches for signals with variations that cannot be ascribed to noise, and hence possibly contain information. So far, about 9 million volunteers in 226 countries have analyzed a total of 15 years of data from the Arecibo telescope, according to Dan Werthimer, co-founder and chief scientist of the SETI@home project. "We have identified about 100 very short radio bursts, about one millionth of a second long, that we don't fully understand," Werthimer said in an e-mail interview, Radio communications from Earth still haven't been ruled out as the source of these signals. So far, no signals have been confirmed as from extraterrestrial civilizations. "We've only had radio for 100 years and lasers for 60 years," Werthimer said. "We are just getting in the game and just beginning to explore the potential different frequencies and signal types that another civilization might use. There's a long way to go before we can do a thorough search. "The good news is that the capabilities of earthlings are growing. The computing power is developing quickly and the FAST telescope will be very powerful," he added. With a dish the size of 30 football grounds, FAST is 500 meters in diameter and made of 4,450 panels. Scientists have depicted it as a super-sensitive "ear", capable of spotting very weak messages – if there are any – from "cousins" of human beings. It will be 10 times more sensitive than the telescopes in the Breakthrough Listen project, a 100 million-U.S.-dollar initiative by Russian tycoon Yuri Milner to search for extraterrestrial civilizations, says Li Di, chief scientist with the radio astronomy department of the National Astronomical Observatories (NAOC). Werthimer is seeking cooperation with Chinese astronomers to develop a SETI@home project for FAST. "We hope to work with China to do SETI at the same time while the telescope carries out sky surveys to search for pulsars, fast radio bursts and to map the galaxy as planned." Though unsure of how such cooperation would work, Li Di is interested in working with the SETI@home project. "With their experience and advanced technologies, they will help us improve the telescope's scientific capabilities and operating conditions. It's like standing on the shoulders of a giant," Li says. Chinese scientists have also actively participated in the preparations for the Square Kilometer Array (SKA), a large multi-radio telescope project to be built in Australia and South Africa. The SKA will eventually use thousands of dishes and up to a million antennas, which will enable astronomers to monitor the sky in unprecedented detail and survey the entire sky much faster than any system currently operating. The search for extraterrestrial life is one of its key science programs. Scientists have surveyed the entire sky with radio telescopes for a half-century now, and they have found interesting signals occasionally. On August 15, 1977, a strong narrow-band radio signal, bearing the expected hallmarks of extraterrestrial origin, was detected by astronomer Jerry R. Ehman while working on a SETI project at the Big Ear radio telescope of Ohio State University. The signal appeared to come from the constellation Sagittarius and lasted 72 seconds. Ehman circled the signal on the computer printout and wrote the comment "Wow!" beside it, which the event is now commonly called. But it has never been detected again. "We don't know when earthlings will discover ET. It could be 1,000 years from now, or in our lifetimes. It could be next year, when FAST gets going on the sky surveys," Werthimer said. Even on Earth, land and sea host completely different forms of life. "It is highly possible that life on other planets is entirely different from that on Earth, and it might not be carbon-based," says Jin Hairong, deputy curator of Beijing Planetarium. Liu Cixin, a Chinese science fiction writer and winner of the Hugo Award for his novel The Three Body Problem, points out the current method assumes that aliens also communicate in radio waves. "But if it's a truly advanced civilization, it is possible to use other more advanced forms of communication, such as gravitational waves." But Mao Shude believes many methods deserve a try: "Who knows what they are and how they think? "When we study the origin of life, we risk going down a blind alley if we only have one sample from Earth," Mao says. "If we could find more samples in the universe, we could look at the puzzle more comprehensively and solve it more easily." He gives an example in astronomy to explain the limitations of a single sample. "When scientists started to look for planets around Sun-like stars, they thought it must be difficult as their period might be as long as a year. However, the first such planet discovered outside our solar system takes only four days to orbit its host star – much faster than astronomers expected. At that time, some people doubted it, showing how the example of our solar system narrowed their thinking." However, the idea communicating with aliens comes with concerns. British astrophysicist Stephen Hawking has warned that communicating with aliens could be a threat to Earth: "If aliens visit us, the outcome would be much as when Columbus landed in America, which didn't turn out well for the Native Americans." But Han Song, another leading Chinese science fiction writer, believes humans naturally want to connect, citing the Internet as proof. "I think aliens might think similarly. It is a biological instinct to connect with each other. Everyone wants to prove that they are not alone in the universe. Loneliness is intolerable to humans," he says. "If they are inferior or equal to us in terms of civilization, we won't be easily destroyed. If they are much more intelligent than us, they wouldn't be so narrow-minded as to compete with us. Some worry they will come to rob us of our natural resources, but they likely have the power to transform the entire globe already. What's the point of eliminating a much lower civilization?"